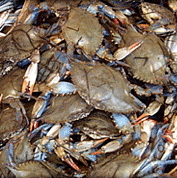 [%image crabs float=left width=150] The Chesapeake Crab Connection specializes in Maryland's famous blue crabs and soft-shell crabs, but the company also sells shellfish from around North America — Maine lobster, Alaskan king crab, North Carolina river shrimp, and the like. block(clear green). Have a favorite regional specialty from Maryland? Share it in the comments section below.